BEND, OR -- Bend firefighters received new life-saving equipment worth more than $14,000, thanks to a grant from an out-of-town sandwich franchise. 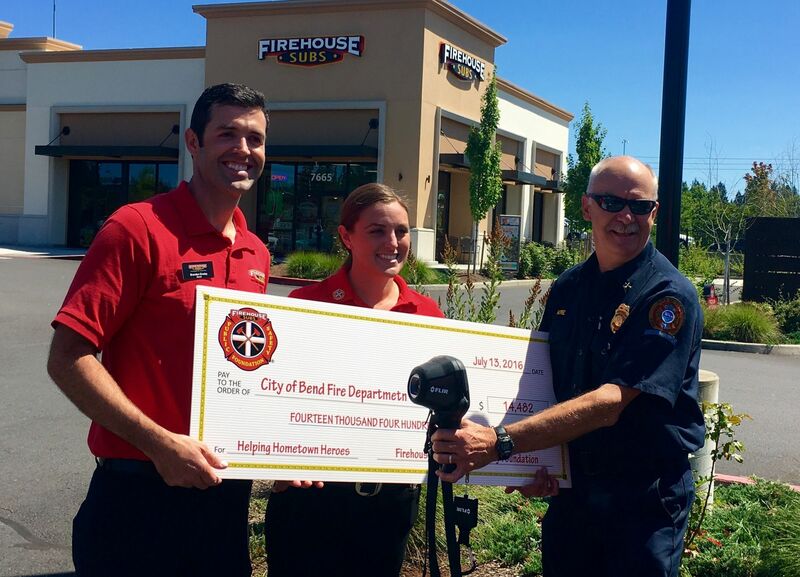 In its most recent grant disbursement, the Firehouse Subs Public Safety Foundation will provide equipment to four Oregon fire departments; Bend received the largest award, in the form of three new thermal imaging cameras. Bend Fire Battalion Chief Dave Howe traveled to Tualatin on Wednesday to formally accept the grant award. He tells KBND News these cameras are used on every fire call. "For example, in a burning building, if somebody’s trapped, they’re going to have a different heat signature than the surrounding area and we can actually see them in the dark and be able to locate victims and get them out of the building. It also can sense the difference in the wall, where a hot spot is." He adds, "It has the ability to record, so we can use that for documentation. They’re very, very accurate. You can actually put your hand on a wall, take your hand away, aim the thermal imaging camera at the wall and you can see your hand print." Howe says the grant allows Bend Fire to begin replacing its current fleet of aging cameras. "We have six of them that are first generation, that are like 12-years-old that are very, very expensive to repair – we’ve had them in the repair shop multiple times; they’re on their last legs. To get these three is a real boon to us. These are state of the art, really nice units; very, very sturdy. They’ve made a lot of improvements in the last dozen years." The Firehouse Subs Public Safety Foundation typically disperses grants and equipment only to agencies within 60 miles of a restaurant franchise. But, with the closest restaurant in Eugene, Howe says Bend Fire is very grateful they made an exception.